Thu., Jan 18, 1917 A.28b.7.8. 6 AM Weather fine but hazy. Wind North East. 1 PM No hostile artillery fire. Hostile trench mortars slightly active. 3 PM Situation quiet. Wind still North East. 6 PM Working party of 92 men detailed on general trench repairs and draining. 10 PM Situation very quiet. 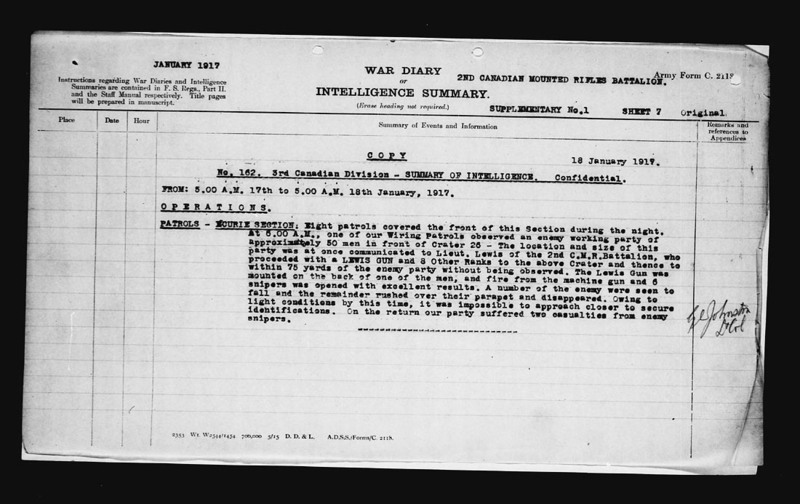 FROM: 5.00 A.M. 17th to 5.00 A.M. 18th January, 1917. O P E R A T I O N S.
Eight patrols covered the front of this Section during the night. 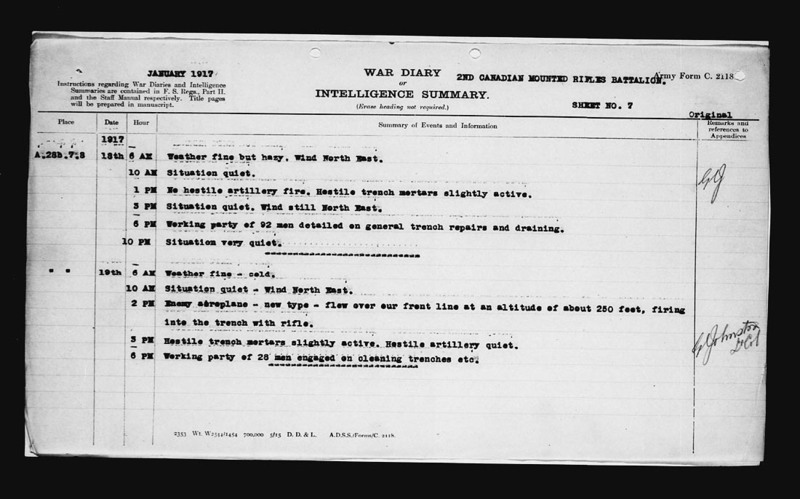 At 6.00 A.M., one of our Wiring Patrols observed an enemy working party of approximattely 50 men in front of Crater 25 – The location and size of this party was at once communicated to Lieut. Lewis of the 2nd C.M.R. Battalion, who proceeded with a LEWIS GUN and 8 other ranks to the above Crater and thence to within 75 yards of the enemy party without being observed. The Lewis Gun was mounted on the back of one of the men, and fire from the machine gun and 6 snipers was opened with excellent results. A number of the enemy were seen to fall and the remainder rushed over their parapet and disappeared. Owing to light conditions by this time, it was impossible to approach closer to secure indentifications. On the return our party suffered two casualties from enemy snipers.